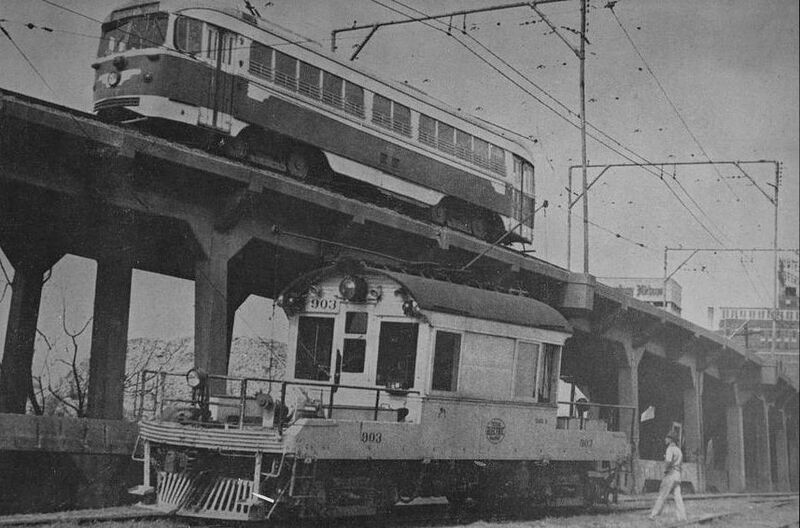 The interurban did some exchange of freight cars with the regular railroads and the exchange tracks were under the streetcar/interurban viaduct. This track merged with the streetcar tracks at the foot of the viaduct right next to the DMN. The interurban, though primarily a mover of people, also hauled freight. With more than 200 miles of track across North Texas, the Texas Electric Railway was the largest interurban railway operator in the South. But its glory days were starting to wane as the popularity of automobiles increased. By the ’20s, freight-moving was added to the company’s services, generating welcomed revenue. The interurban freight depot — seen below in 1946 — was located just east of Ferris Plaza. At the left, part of a railroad freight car is visible, in the middle, an interurban freight car, at the right, an interurban (passenger) streetcar, and at the far right, an automobile. And some crazy person walking. But the automobile eventually proved too popular, and more and more people began using trucks for hauling. 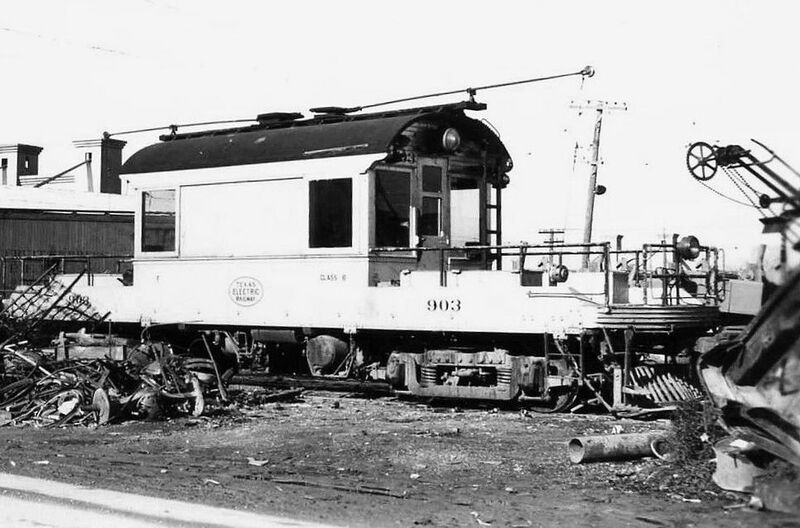 After 40 years in business, the Texas Electric Railway interurban ceased operations in 1948. When searching around for possible other images of engine 903 (as seen in the top photo), I found it hanging out over on eBay — described as being in the “Waco car house yards” in 1944. Small world. Top image found on Flickr, here. Photo of the freight depot taken by Robert W. Richardson on April 27, 1946; from the Western History/Genealogy Dept., Denver Public Library, viewable here. Bottom photo (cropped) from a currently active eBay listing, here. Interurban freight operation Wikipedia entry here. Texas Electric Railway: Handbook of Texas entry here; Wikipedia entry here. MANY photos of various Texas Electric Railway freight motors and locomotives, here. And, lastly, great photos from around Dallas in CERA’s “Texas Electric and the Journey to DART,” here. The T.E.Ry. was prohibited from moving freight cars through Dallas. They would switch the cars off to the MKT Railroad near he viaduct. MKT or “The Katy” would haul them around town and through Highland Park and then give them back to the TERy at their interchange track at Mockinbird Lane and Greenville Avenue vicinity. Thanks, Andy! Imagine hauling freight through Highland Park! 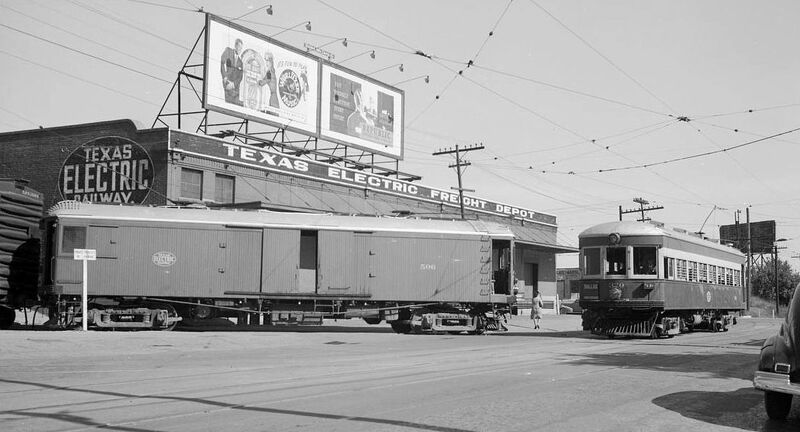 One of the Texas Electric Railway freight locomotives went to the Pearl Brewery after the interurban operation shut down. It might be the one that’s preserved at the brewery site today. I need to verify that.